My home subway station is Kings Highway on the Brighton line, in southern Brooklyn, and served by the B and Q trains. The station has three entrances and typically when I enter or exit, I rush in or out. Sometimes I slow down and look at something on the station walls. I am quite familiar with these murals but they are quirky and have a subtle humor that makes me smile. Titled “Kings Highways Hieroglyphics” and designed by Rhoda Yohai Andors, these art panels show an updated version of the ancient Egyptian art style. Occasionally I see people peering carefully at the artwork or snapping photos. 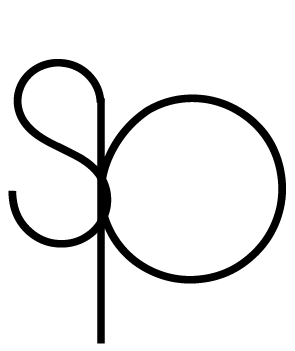 Once I watched a teenager sketching a segment of it in a drawing pad. Usually commuters dash by the art and take little notice of it, but some make the effort to look. Hopefully they enjoy it, or are confused by it, or chuckle. Public art is well-known and seen throughout New York City, especially in the parts of Manhattan that are familiar to tourists. Some public art displays in Central Park are even global events. But public art is not just placed in our city’s parks, or parked in front of famous buildings, or sitting on public mall spaces. Some of the finest and most intriguing pieces are found within the stations of New York City’s subway system. There is a wide variety of pieces installed within the stations of Manhattan, Brooklyn, the Bronx and Queens. While not every station has artworks and some have just decorative motifs, there is a great deal of art, of many styles, in the underground and elevated stations. It can be found on the walls and in the middle of the platforms, on the corridors, surrounding token booths, turnstiles and gates, and even right outside the stations. Why have this kind of public art? Raquel Laneri, in the 2009 Forbes essay “Why We Love—And Need—Public Art,” explains that “we need public art because it improves our quality of life, because it makes us stop and open our eyes” and perhaps find intellectual and emotional stimulation. Train stations thus are worthy of such creative treatment. 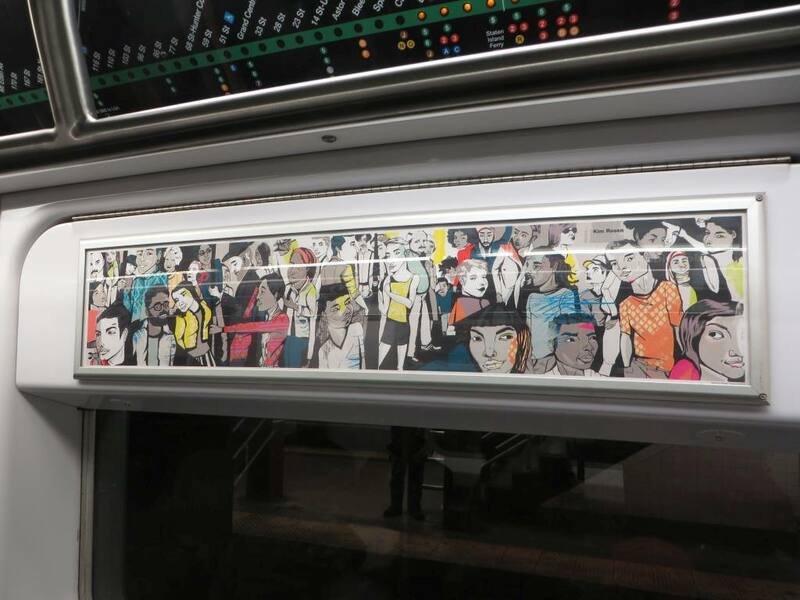 With that in mind, the Metropolitan Transit Authority (MTA), has a long history of soliciting proposals for artworks and installing them in train stations. 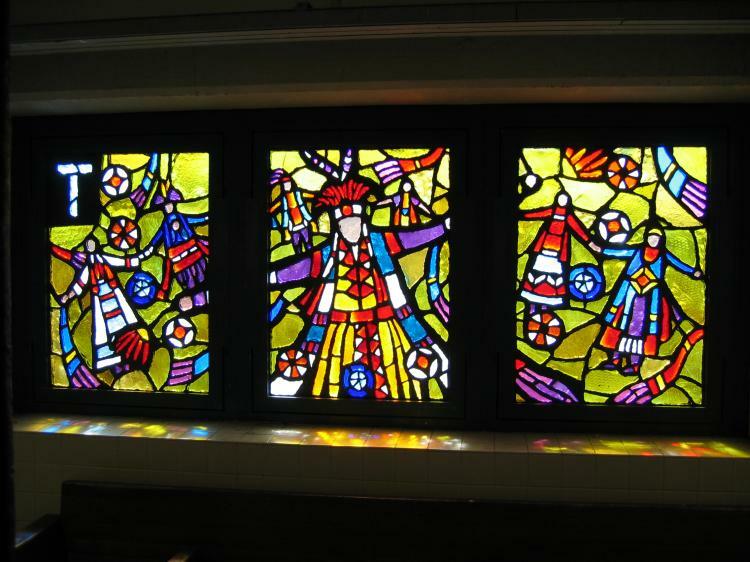 Some pieces are abstract stained glass creations, while others have themes linked to the neighborhoods serviced by the stations. Some stations have tiled mosaics and others display free-standing sculptures. Some feature paintings or even chairs and stools specially made for the stations. The MTA has a “Subway Art Guide” which is nice but confusing in that the listing is alphabetical by artwork title, not by station, which would be easier to navigate). Franklin Avenue (C and S trains), Brooklyn: sets of brightly colored stained glass windows with abstract designs in the above-ground section. A few resemble cherry crushed lollipops. 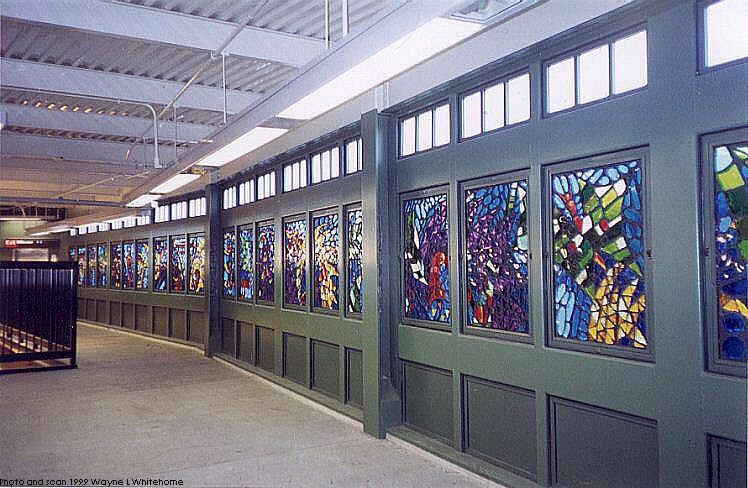 Broadway Junction (A, C. J, L, M, Z trains), Brooklyn: This station has above and below ground sections, and parts of it feature decorative pieces such as stained glass windows and a pretty tiled mural on the wall of a transfer section. Van Siclen Avenue (J train), Brooklyn: One central platform serves trains in both directions. It features several intriguing, stained-glass, free-standing pieces. 14th Street at Eighth Avenue (L train section), Manhattan: There are several whimsical little brass sculpted pieces throughout the platform and the hallway leading to the A, C and E trains (and even a few above ground, by the elevator on the sidewalk) which were designed by noted artist Tom Otterness. 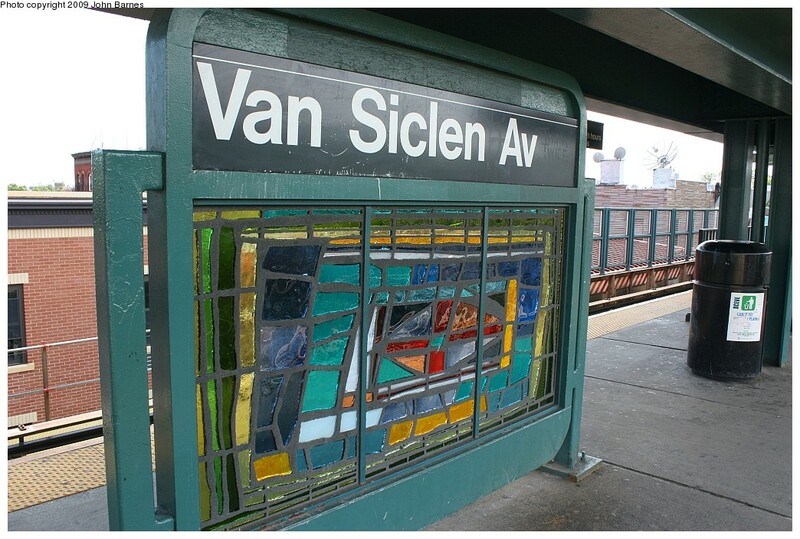 46th Street- Bliss Street and 40th Street-Lowery Street (7 train), Queens: Lush, detailed stained-glass windows depict sports, historic events and nature. Q is For Queens, Yumi Heo (1999). 46th Street/Bliss Street, Photo by: Robbie Rosenfeld. Notes: “T” panel. In Manhattan, some of the most interesting sets of artwork can be found at 42nd Street-Times Square (many trains), 207th Street (A train), and stations in Harlem such as 125th Street.